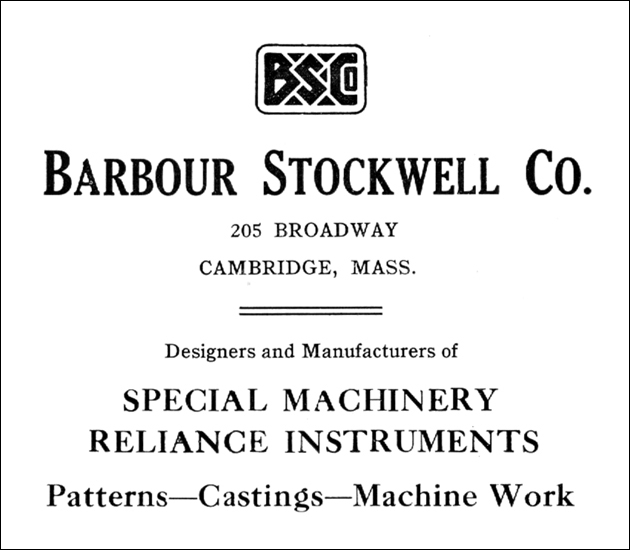 The Barbour Stockwell Company emerged in Cambridge out of the consolidation of several distinct New England machinery producers. Among these producers were Denio & Roberts, developers of machinery for cutting crackers and biscuits; Allen & Endicott, general machinery manufacturers; Morrill & Allen, creators of railroad track materials; and Walworth Manufacturing Company, producers of grey iron castings. At the time of its consolidation in 1890, Barbour Stockwell purchased the land and buildings owned by Allen & Endicott to use as its works. By 1893, the firm had expanded to cover over three acres of land in the area framed by Broadway, Market, Clark, Hampshire, and Portland Streets. Throughout the early twentieth century, Barbour Stockwell continued to grow, acquiring such additional manufacturers as the Broadway Iron Foundry and the Blanchard Instrument Company. (Stone, 1930).